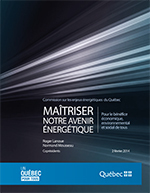 Report from the Quebec Commission on Energy Issues that was co-chaired by Roger Lanoue and myself . This report, entitled Mastering our Energy Future : For the economic, environmental and social benefit of all, was produced after a set of hearings held across Québec with the help of more than 460 memoirs produced by more than 800 citizens, groups and industries. The Commission was created by Québec’s Natural Resources Minister, Martine Ouellet, on July 4th 2013 and its report was provided to the Minister at the end of January 2014. This report was produced by a small independent team that included Guy Versailles, writer; Marie-Sophie Villeneuve, who analyzed and dissected all the recommendations; Yvan Dutil, researcher/analyst and Lilianne Bessner for the linguistic revision. Our team was support by the Ministry of Natural Resources, in particular: André Auclair, secretary to the Commission and Normand Beauregard, who ensured the liaison with the specialists at the MRN and help organized the expert tables and many other tasks. The complete report (in French) can be found here. It is also useful to look at the Consultation document, leading the commission, that was prepared under my direction . De la réduction des gaz à effet de serre à l’indépendance énergétique du Québec. From Greenhouse Gas Reduction to Québec’s Energy Self-Sufficiency - Consultation Paper.